December capped a solid year of job growth as the economy generated positive hiring every month in the year for the first time since 2005. The private sector led the way, marking its most substantial growth in six years. 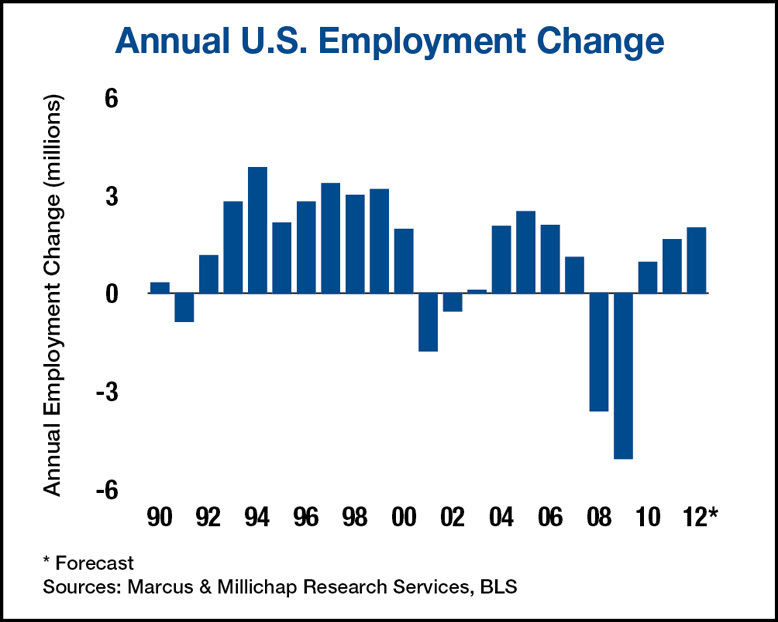 This trend should continue, with the labor market generating gradual momentum during 2012 as employers continue to re-staff to meet rising demand for goods and services. Lingering downside risks, however, will repress hiring from achieving breakaway growth. Political posturing in Washington will fuel uncertainty through the year while eurozone troubles will restrain the U.S. economic outlook in 2012. The unemployment rate fell 20 basis points in December to 8.5 percent, the lowest level since early 2009, as all of the 10 private-employment sectors added workers for the month. In December, 212,000 private-sector positions were created, offsetting a loss of 12,000 government posts and yielding a net gain of 200,000 total jobs. A seasonal surge in retailer and package delivery hiring supported the creation of 90,000 trade, transportation and utilities jobs, while education and health services continued its year-long expansion, adding 29,000 workers. The holidays also contributed to the hiring of 21,000 leisure and hospitality employees, with nearly all of the gains recorded in bar and restaurant employment. Despite the supply-chain ripples of the natural disaster in Japan, political gridlock at home and the U.S. debt downgrade in August, the labor market staged a respectable broad-based recovery for the year. The private sector led the way, hiring more than 1.9 million employees, with only the information sector completing the year in negative territory. Factoring in a loss of government positions, more than 1.6 million jobs were created in 2011. Professional and business services employers led the gains, adding 452,000 jobs, while retail-related hiring sustained additions of nearly 400,000 workers. The financial services sector generated its first annual gain since 2006, adding 7,000 jobs in 2011. Fueled by the gains in the financial services and professional and business services sectors, full-time office-using employment rose by nearly 327,000 workers in 2011. The increase in jobs enabled companies to backfill empty cubicles and generated a modest increase in new office space requirements. Nationwide, net absorption of more than 25 million square feet pushed office vacancy lower by 40 basis points to 17.2 percent last year. Continued demand momentum in 2012 and restraint in development will amplify this positive trend, generating an additional 70-basis-point decline in vacancy in the coming year. Job growth in 2011 supported an increase in retail spending, resulting in more trips to shopping centers across the country. The rise in traffic fueled a tempered pace of new store openings and drastically reduced the rate of closures, generating a 30-basis-point decline in national retail vacancy to 9.7 percent. In the year ahead, single-tenant space will account for a sizable portion of completions, while retailers expand cautiously, leading to a decline in vacancy of 50 basis points to 9.2 percent. Apartments continue to benefit from the creation of new rental households that accompanies a job market revival. The national vacancy rate fell 120 basis points in 2011 to 5.4 percent, while effective rents remained on pace to grow 4 percent. Continuing preference of rental housing over homeownership by many, and solid hiring in the renter-heavy 20- to 34-year-old age cohort will support an additional 40-basis-point decline in vacancy during 2012 and spark a 4.8 percent jump in effective rents. This entry was written by marcusmillichap, posted on January 7, 2012 at 12:18 am, filed under Research and tagged Commercial Real Estate, Employment, research. Bookmark the permalink. Follow any comments here with the RSS feed for this post. Trackbacks are closed, but you can post a comment. Thourough and extensive analysis of current economic conditions; beneficial to industry professionals and investors.